The dual clutch transmission has 7 (or 6) forward speeds and one reverse speed. The individual speeds are selected automatically in the D (Drive) position. Before leaving the driver’s seat, always make sure the shift lever is in the P (Park) position, then set the parking brake, and place the ignition switch in the LOCK/OFF position. Unexpected and sudden vehicle movement can occur if these precautions are not followed. Do not use engine braking (shifting from a high gear to lower gear) rapidly on slippery roads. The vehicle may slip causing an accident. - Think of it as an automatically shifting manual transmission. 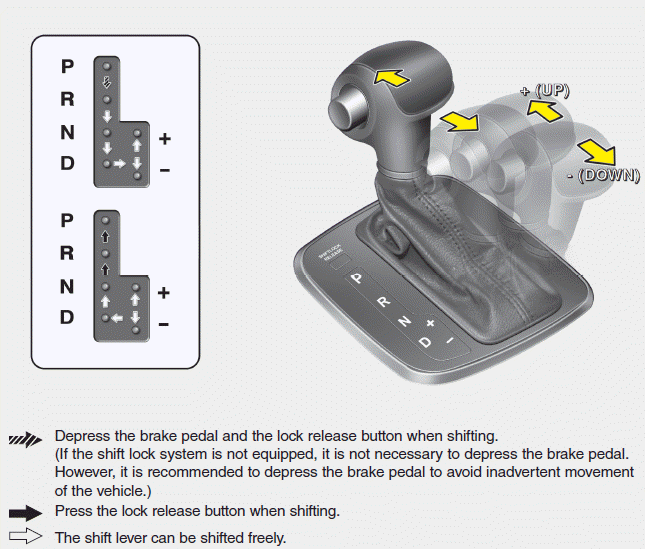 - Shift into Drive range and get fully automatic shifting, similar to a conventional automatic transmission. Dual clutch transmission adopts drytype dual clutch, which is different from torque converter of automatic transmission, and shows better acceleration performance during driving. But, initial launch might be little bit slower than Automatic Transmission. The dry-type clutch transfers torque and provides a direct driving feeling which may feel different from a conventional automatic transmission with a torque converter. This may be more noticeable when starting from a stop or low vehicle speed. When rapidly accelerating at low vehicle speed, engine could rev at high rpm depending on vehicle drive condition. 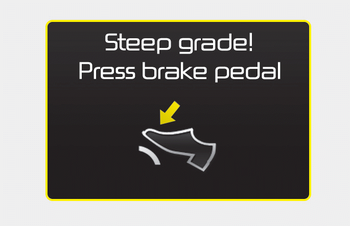 For smooth launch uphill, press down the accelerator pedal smoothly depending on the current conditions. If you release your foot from the accelerator pedal at low vehicle speed, you may feel strong engine brake, which is similar to manual transmission. When driving downhill, you may use Sports Mode and press the paddle shifters to downshift to a lower gear in order to control your speed without using the brake pedal excessively. When you turn the engine on and off, you may hear clicking sounds as the system goes through a self test. This is a normal sound for the Dual Clutch Transmission. To hold the vehicle on a hill use the foot brake or the parking brake. If the vehicle is held by applying the accelerator pedal on a hill the clutch and transmission will be overheated resulting in damage. At this time, a warning message will appear on the LCD display and you may feel a vibration. If the clutch becomes overheated by excessive use of the clutch to hold on a hill, you may notice a shudder feeling and a blinking display on the instrument cluster. When this occurs, the clutch is disabled until the clutch cools to normal temperatures. If this occurs, pull over to a safe location, shift into P (Park) and apply the foot brake for a few minutes. If the LCD warning is active, the foot brake must be applied. 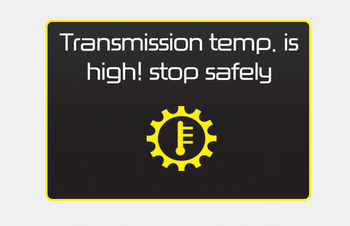 Ignoring the warnings can lead to damage to the transmission. If the display continues to blink, for your safety, we recommend that you contact an authorized Kia dealer. Under certain conditions such as repeated launch on steep grades, the clutch in the transmission could overheat. When the clutch is overheated, the safe protection mode engages. If the safe protection mode engages, the gear position indicator on the cluster blinks with a chime sound. At this time, a warning message will appear on the LCD display and driving may not be smooth. If you ignore this warning, the driving condition may become worse. To return the normal driving condition, stop the vehicle and apply the foot brake for a few minutes before driving off. Gear shifts may be more noticeable than a conventional automatic transmission. This is a normal characteristic of this type of dual clutch transmission. The overheated Dual clutch transmission may change the gear shifting characteristics, and illuminate the warning message on the LCD display under the conditions that operation of the kickdown mechanism is repetitively used. 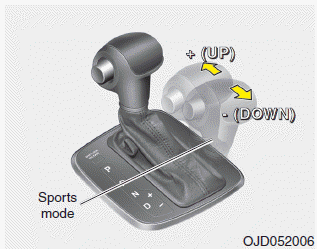 Do not use the kickdown mechanism to return to the normal driving condition. Also, temporarily stop the vehicle at a safe location, when the warning message illuminates on the LCD display. During the first 1,500 km (1,000 miles), you may feel that the vehicle may not be smooth when accelerating at low speed. During this break-in period, the shift quality and performance of your new vehicle is continuously optimized. Always come to a complete stop before shifting into D (Drive) or R (Reverse). Do not put the shift lever in N (Neutral) while driving. Always come to a complete stop before shifting into P (Park). To shift from P (Park), you must depress firmly on the brake pedal and make sure your foot is off the accelerator pedal. The shift lever must be in P (Park) before turning the engine off. Shifting into P (Park) while the vehicle is in motion may cause you to lose control of the vehicle. After the vehicle has stopped, always make sure the shift lever is in P (Park), apply the parking brake, and turn the engine off. Do not use the P (Park) position in place of the parking brake. Always come to a complete stop before shifting into or out of R (Reverse); you may damage the transmission if you shift into R (Reverse) while the vehicle is in motion. The wheels and transmission are not engaged. Use N (Neutral) if you need to restart a stalled engine, or if it is necessary to stop with the engine ON. Shift into P (Park) if you need to leave your vehicle for any reason. Always depress the brake pedal when you are shifting from N (Neutral) to another gear. Do not shift into gear unless your foot is firmly on the brake pedal. Shifting into gear when the engine is running at high speed can cause the vehicle to move very rapidly. You could lose control of the vehicle and hit people or objects. Do not drive with the shift lever in N (Neutral). The engine brake will not work and lead to an accident. Follow below steps when parking and you want the vehicle to move when pushed. 1. After parking your vehicle, depress the brake pedal and move the shift lever to [P] with the ignition button in [ON] or while the engine is running. 2. If the parking brake is applied unlock the parking brake. - For EPB (Electronic Parking Brake) equipped vehicles, push the brake pedal with the ignition button in [ON] or while the engine is running to disengage the parking brake. If [AUTO HOLD] function is used while driving (If [AUTO HOLD] indicator is on in the cluster), press [AUTO HOLD] switch and [AUTO HOLD] function should be turn off. 3.While pressing the brake pedal, turn the ignition button [OFF]. - For smart key equipped vehicles, the ignition switch can be moved to [OFF] only when the shift lever is in [P]. 4.Change the gear shift lever to [N] (Neutral) while pressing the brake pedal and pushing [SHIFT LOCK RELEASE] button or inserting, pressing down a tool (e.g. flathead screw-driver) into the [SHIFT LOCK RELEASE] access hole at the same time. Then, the vehicle will move when external force is applied. With the exception of parking in neutral gear, always park the vehicle in [P] (Park) for safety and engage the parking brake. Before parking in [N] (Neutral) gear, first make sure the parking ground is level and flat. Do not park in [N] gear on any slopes or gradients. If parked and left in [N], the vehicle may move and cause serious damage and injury. After the ignition switch has been turned off, the electronic parking brake cannot be disengaged. For EPB (Electronic Parking Brake) equipped vehicles with [AUTO HOLD] function used while driving, if the ignition button has been turned [OFF], the electronic parking brake will be engaged automatically. Therefore, [AUTO HOLD] function should be turned off before the ignition button is turned off. This is the normal driving position. The transmission will automatically shift through a 7 (or 6) gear sequence, providing the best fuel economy and power. For extra power when passing another vehicle or driving uphill depress the accelerator pedal further until you feel the transmission downshift to a lower gear. In Sports Mode, moving the shift lever backwards and forwards will allow you to select the desired range of gears for the current driving conditions. + (Up) : Push the lever forward once to shift up one gear. - (Down) : Pull the lever backwards once to shift down one gear. Only the 7 (or 6) forward gears can be selected. To reverse or park the vehicle, move the shift lever to the R (Reverse) or P (Park) position as required. Downshifts are made automatically when the vehicle slows down. When the vehicle stops, 1st gear is automatically selected. When the engine rpm approaches the red zone the transmission will upshift automatically. If the driver presses the lever to + (Up) or - (Down) position, the transmission may not make the requested gear change if the next gear is outside of the allowable engine rpm range. The driver must execute upshifts in accordance with road conditions, taking care to keep the engine rpms below the red zone.